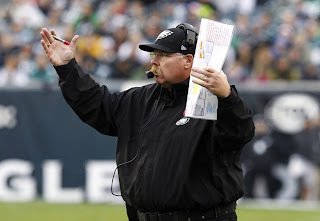 Is there anything Andy Reid can do to save his job in Philadelphia? It seems that once again, the hottest seat in the NFL resides in Philadelphia (well there's a shock). The chances for Andy Reid to return for a 15th season with the Eagles seem slim to none at this point, so is there anything that Reid can do to save his job? Reid has definitely realized that his seat is getting hot when he fired defensive coordinator Juan Castillo two weeks ago. Now Castillo, who was the team's long time offensive line coach, never should have been hired as the defensive coordinator before last season but cutting him loose at this point in the NFL season made it apparent that Reid is trying to make someone else the fall guy. And that firing blew up in Reid's face when the Philadelphia defense got torched by Matt Ryan and the Atlanta Falcons this past Sunday and that marked the Eagles' third straight loss and dropped them to 3-4. Barring an unlikely run, Reid is done. It is clear the players are not responding to him anymore and the team has disappointed the past two seasons after having such high expectations last season. Those fans want a Super Bowl and this club, who is already two games behind the Giants for the division lead. Making the playoffs will not cut it, Reid somehow has to engineer a Super Bowl run, or maybe even a deep playoff run at this point. Whether that means giving LeSean McCoy the ball more (which should happen regardless), whether that means turning to the Arizona prospect Nick Foles at quarterback and finally pull the plug on Mike Vick, there is not much Reid can do to save his job besides winning and winning a lot.